Superb tone. Well made. Keenly-priced. American amplifier manufacturer Supro received a substantial profile boost recently with the unveiling of the 1695T Black Magick, a recreation of the modified 1959 1690T Coronado combo Jimmy Page employed in the early days of Led Zeppelin. He used the amp to record the solo of Stairway To Heaven. So, yeah, it was kind of a big deal and people got excited. There's a lot more to the Supro line than Jimmy's old backline, though, and we've got our hands on a couple of new models: the 1642RT Titan and 1675RT Rhythm Master. We're talking about The Two Ronnies of the Supro line here. Today we're looking at the Rhythm Master, an amp with a switchable output 1x15-loaded character carrying a bit more beef than the Titan. The amp has an onboard reverb and a tremolo unit driven by the output tubes. Before we get involved with the noises on tap here, can we just take a step back and enjoy the view? This amp is pretty! It looks like something Brian Setzer would keep in his front room. While Jimmy Page's combo offered two channels that could be run together to produce more gain, the Rhythm Master possesses a single channel. Kicking off with a single volume control, the menu proceeds with EQ (treble and bass), the reverb, tremolo knobs (speed and depth) and robust on/off and standby switches. The Rhythm Master also features a three-way rectifier switch that selects the 35, 45 and 60 watt output modes. "TheRhythm Master's single 15 should endear it to roots players, specifically blues practitioners." Firing up, the immediate impression is just how straightforward it is to use. There's no faffing about with banks, menus, LED screens or any of that shizzle. Right from the off, the sounds we hear are warmer than the Prodigal Son's reception. We used a '67 Gibson SG Junior and RebelRelic Thinline for the test and their respective single coils are more than happy with the glassy but warm tones on offer. The Rhythm Master's single 15 should endear it to roots players, specifically blues practitioners. There's something about the grit that lives in a 15-loaded amp that's just right for Texas blues. Adding a Tube Screamer releases our inner SRV, as you might expect. Also fun is driving the amp's front end hard with our faithful Retroman Beano treble booster, which gives us more of a British blues boom response, even more so when we introduce a humbucker to the amp: bags of grunt and sustain without unsightly hard-rock gain. The effects? The reverb runs from an almost dry room sound to a splashy surfvibe - and if you can use the tremolo circuit without succumbing to the opening riff of Creedence Clearwater Revival's Born On The Bayou, you have more willpower than us! Think of great amplifiers of the 50s and 60s and we guarantee you'll visualise the usual suspects: Fender, Marshall, Vox. Supro should be on that list, and not just 'cos Jimmy Page couldn't get enough of its stuff when he was making his bones. 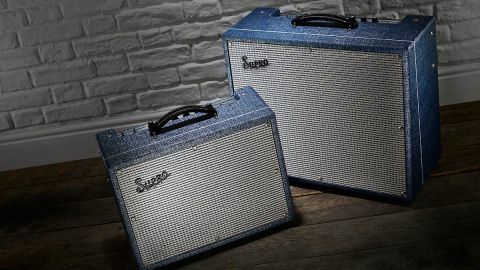 These revitalised Supros offer first-class build quality, beautifully simple layouts and life-changing tones for bang on the right price.